­­­Day1: Welcome at the airport of Djanet. Immediate departure to Imaharhaten on the side of the top Tassili to join the downs Adjalati which show us the gate of Oued In Djeran. Day 2: We go along the Oued visiting numerous rupestral paintings. Then we arrive to the big downs of Tin- Merzouga, vermilon at the setting sun, possible walking. Day 3:Visit of roks of Tamesguida, Tehe Tahoussait, grots between the peaks, castles, and the downs of Moul Enagua which climb up to the cliffs. 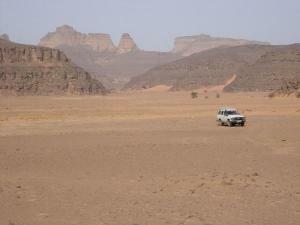 Day 4: We go throw the Tassili of Tin Zirene, land of mirages from there we could join Alidema. Day 5: Way back to Djanet, going throw the engraving of teghargharte. Day 7: Way back to Djanet, visit of its oases and palm gadens. Day 8: fly back.